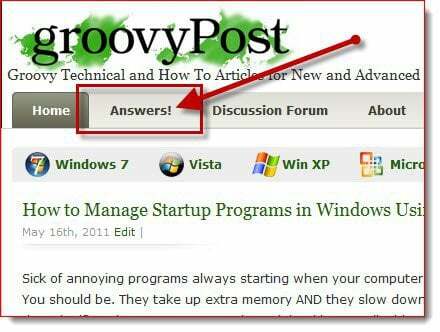 Introducing Groovy Answers! - Our New Q&A Community Site! Beginning with my very first post back in February 2007, my mission has always been to provide clear and easy to find answers. 4 Years and over 1,000 answers later, thank to our amazing groovyReaders, groovyPost is still going strong with a thriving and growing community. Over the years however, I’ve received countless emails from readers about computer tips or problems I’ve not yet had time to write about. Being that groovyPost is still just a part-time hobby for me, my time is shared between my real day job, my family and groovyPost so unfortunately I’ve just never had time to answer every question. So with this in mind, back in March / April, I started off on a mission to create a new Community Forum which our readers could use to ask for and receive help from the groovyPost team as well as other knowledgeable groovyReaders like you. The primary requirement – Make it SIMPLE to ask for help! Although we already had a Community discussion forum where you could ask questions, many sent me feedback that it was to complicated and had a hard time trying to figure out how to register and ask a question. I think we fixed this with Answers! 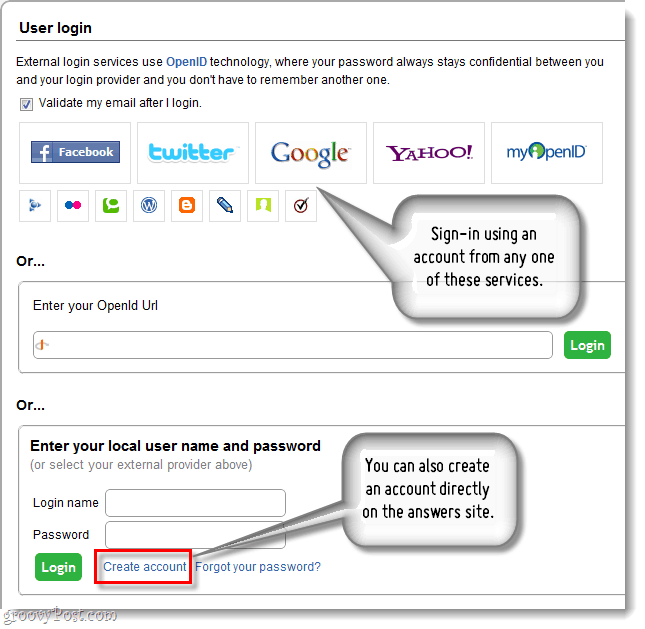 by allowing you to Ask your Question using your Facebook, Twitter, Gmail or even a Yahoo account. If your logged into one of those services (and a few others as well), asking a question should be super simple and automatic after you ask OR answer your first question. 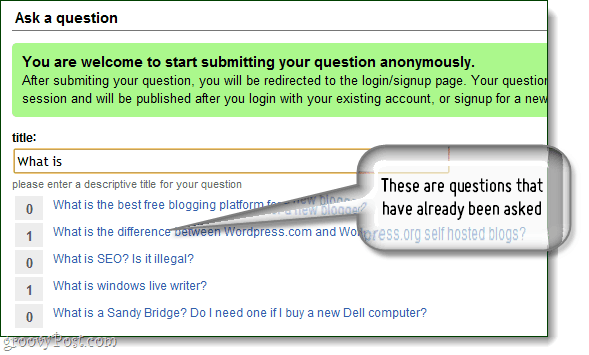 If you prefer, you can also create a local account on Answers as shown at the bottom of the screenshot above. The good news is there’s a lot of flexibility! The new site is also intelligent in that as you are asking your question, the system is automatically checking to see if we already have an answer on that topic. Overall we tried to make the site as Community friendly as possible to encourage everyone to participate. We’ve invited a few people to play with the site last week and so far, the feedback has been really positive. Although we’re launching the site with a “Beta” tag. This means that we’re constantly improving the service including the look and feel and once we until the community grows up a bit and we all get a little bit more familiarized with the site. I’m really excited about groovyPost Answers and I hope you find the site as useful and fun as I think you will. Be sure to check it out today and tell all your friends about it as well so we can turn it into a thriving groovy tool all of us can benefit from! Wow, the new answers section is really cool. I like that I can use my Google account to sign-in. What kind of questions can I ask?